3 bedroom, annual, 3 week package inc. 2 winter and 1 summer, Ocean front. The Ritz Carlton Club St. Thomas offers an unparalleled vacation experience through their Destination Club fractional ownerships. Nestled along perhaps the most beautiful beach in all of St. Thomas, The Ritz Carlton Club provides a practical way for those with discriminate tastes to bask in the lap of luxury. Ritz Carlton has combined their award-winning amenities and service with a breathtakingly beautiful destination to provide Destination Club members with the ultimate luxury vacation. St. Thomas is world renowned for its pristine natural beauty. Miles and miles of sugary white sand coastline hug against idyllic turquoise bays, providing the perfect setting for lounging the afternoon away in paradise or partaking in any number of the islands outdoor adventures. The added bonus of a wonderful year-round Caribbean climate and duty-free shopping make St. Thomas a global vacation destination. Set on 30 oceanfront acres along majestic Great Bay, fractional owners of The Ritz Carlton Club St. Thomas can enjoy a stay in any number of two or three bedroom residences that line the beautiful beach of Great Bay. 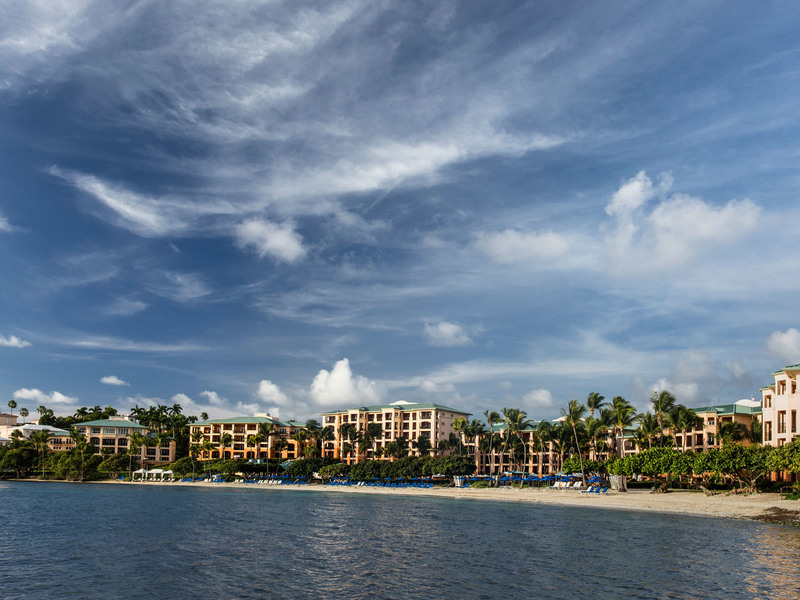 The Club graciously shares the wonderful beachside site with the Ritz Carlton St. Thomas. Ranked by Fodors as the number one resort property on the island of St. Thomas, The Ritz Carlton offers Club members an array of unparalleled amenities. Members can enjoy a beachside massage at the European spa and health club, a breathtaking catamaran cruise, or an afternoon of tennis, with the peace of mind knowing that a personal concierge can arrange everything their heart desires. Ritz Carlton Club St. Thomas timeshare resale members can rest assured that no detail has been overlooked, as the Ritz Carlton staff truly believes in making your stay as enjoyable and carefree as possible. Dedicated Club Concierge is available at any hour to take care of every possible need, and twice daily housekeeping ensures you luxury suite will always be immaculate. Tennis enthusiasts will love playing a match or two at the lighted ocean side tennis courts. Swimmers and those looking for refreshing relaxation can take advantage of the full-service aquatics center offered by the Ritz Carlton Hotel. For a truly relaxing experience, the European style spa and health club awaits. Here members can pamper themselves with steam, sauna, massage and specialty spa treatments. For a special day, the Club Member Concierge can arrange a day sail or sunset cruise on the luxury 53-foot catamaran. Members can also enjoy a fine dining experience at the Great Bay Grill or a relaxing meal at the Coconut Cove Beach Bar and Grill. Ritz Carlton Club St. Thomas timeshares for sale epitomize luxury and convenience. The spacious residences are elegantly furnished with all of the latest designer touches. Each residence includes top of the line appliances, upscale fixtures, premium floors, and elegant marble countertops and surfaces. Members can also enjoy food and drinks at their exclusive members-only lounge. A personal storage facility is also conveniently available to keep your golf clubs and vacation gear safe, negating the need to haul equipment in and out of the residence. Truly, no stone has been left unturned. Members simply enroll in the Ritz Carlton Destination Club through the purchase of interest in a real estate trust that holds title to properties. The Ritz Carlton Club St. Thomas timeshare resale is then transferred to the Destination Club members. The fractional ownership is a deeded interest that can be passed down through the family. Members receive an annual allotment of Destination Points, which they can use to schedule vacations to any of the seven Ritz Carlton Club locations and at over 50 resorts offered by the Marriott Vacation Club Collection. Having so many vacation destination choices available is what makes Destination Club membership so spectacular. Unlike traditional timeshares or fractional ownerships, Destination Club members can choose from an endless array of vacation destinations. What's the Best Way to Join Ritz Carlton Destination Club? The best way to become a Ritz Carlton Club owner is to buy a Ritz Carlton fractional ownership for sale by an owner. Some call it Ritz Carlton timeshare resale. Others call them fractional resales. Whichever you choose to call it, you can save thousands by purchasing a Ritz Carlton fractional ownership on the resale market. A fractional resale just means the ownership was previously owned. Instead of buying from Ritz Carlton Destination Club directly, you can buy from a someone who paid retail price and is now selling it below retail price. Premier Timeshare Resale's agents are here answer all your questions and handle your purchase from start to finish with no stress for you.